Dropping out of League 1 has to be a learning experience for the MK Dons squad, says manager Keith Millen after their fate was finally sealed on Saturday. 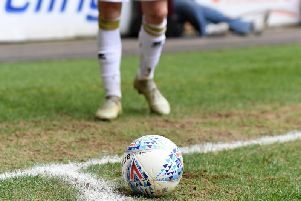 The 2-0 defeat to Scunthorpe was the final nail in Dons' coffin as League 2 football was confirmed in the penultimate game of the season. Millen, who took over from Dan Micciche as manager last Sunday having served as his assistant since January, said the dressing room was a very quiet place following relegation, but said his players must take it on the chin and become better players as a result. "It's quiet in there," he said. "There are a few young lads in there and I told them they have to learn from it. They can't hide from the fact they've been part of a relegation and they have to make sure they don't go through it again. It makes you tougher, and if it doesn't make you tougher, you don't become a better player. "Even the loan players, I know they'll go back to their clubs, but they've been a part of it. Hopefully, they won't forget this because if they do, they'll struggle in their careers. "We're hurting - this is the first time I've been relegated, and I didn't come here expecting to put that on my CV. We have to reflect and learn from what has gone on." Dons still have a game to play, taking on Shrewsbury next week at The New Meadow, and Millen expects it to be tough to drag some confidence out of his battered squad. He added: "It will be hard. They have been OK up until now in training. I'm all about standards in training, but it will be tough now. I'll have to look at the squad ahead of the Shrewsbury game - there's not a lot riding on it now. "I still want to go there and win, but it might be that I look at a few different players going forward. There are a few I can freshen it up with."